Adoption Update: OUR PAPERWORK HAS BEEN LOCATED! We are so thrilled that our new social worker, Rita, is really on top of things and has been able to locate our paperwork. Whew! Moving forward on the adoption is many different things, but the most obvious for us is the cost. The domestic program we switched to is less than half the cost of the international adoption, but it is spendy nonetheless. Michael is teaching a homeschooling Latin course this summer to help raise some funds, and I have added a few items to my etsy shop. We have Susan and her crew from Homeschooling Hearts and Minds coming over this weekend for a little visit. Our families are in-person friends, way back from when we both had only one (GASP!!!) child a piece! Eight years (and seven additional children) we have known each other. It doesn't even seem possible it has been so long. With fourth of July behind us, I feel as though summer is coming to an end, rather than just beginning. Does anyone else feel that way? Our Fourth of July was HOT! That's what I remember from the parade, annual neighborhood cookout, and fireworks. It was hot and more hot. Proof we were at the parade. Did I mention it was hot? 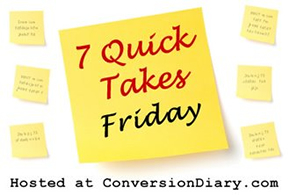 Head over to Conversion Diary to read more Quick Takes. Caution: Quick Takes can be like Pinterest. Once you start, you just can't stop. I do feel like summer is going by way too fast. My friends are just starting their adoption journey.It's exciting to see your journey moving forward! It's been super hot here, too. Lots of indoor play or outside in the water. I was just saying yesterday how fast this year is going! Congrats on item one! We skipped our parade this year because of heat. You are brave! How exciting about the paperwork being found! Praying that the Lord would provide in a might way for the adoption. Wonderful news on the adoption! !